Getting Vegan Food While Travelling through South Korea Part 2: Smaller Cities | S.K. in S.K. Posted on February 15, 2015	by Sara K.
You should read Part 1: Major Metropolises because a) there’s a 99% chance that you’ll have to spend time in a major metropolis and b) some of the info in that post applies to smaller cities. Some smaller cities (such as Gyeongju, Andong, and Jeju City) have conveniently located, inexpensive, and tasty vegetarian/vegan eateries. Being veg*n in these smaller cities is arguably easier than in a metropolis because you don’t have to go so far to get to the local veg*n restaurant. Some smaller cities (such as Jeonju) have tasty, inexpensive veg*n restaurants in *inconvenient* locations. In Jeonju specifically, I think think it’s worth taking the bus to get to the Loving Hut, especially since that Loving Hut is cheaper than the restaurants in Jeonju’s tourist district. Some smaller cities, such as Chungju and Gangneung, do not have any specifically vegetarian restaurants (as of 2014, I would be happy to see this change). The best English websites to check are Happy Cow and Loving Hut South Korea. Remember, when you are in a vegetarian restaurant, whether in a metropolis or a smaller city, it’s a good idea to stock up on things like vegan instant noodles for those times when getting veg*n food is less convenient. I am going to be blunt. By East Asian standards, South Korean convenience stores are bad. I wish there were Japanese convenience stores in South Korea. But the South Korean convenience stores are what’s available. The number one, reliably vegan food in convenience stores is microwavable rice. A saving grace of South Korean convenience stores is they almost always have a microwave available for customers. Even things like potato chips often have animal products in them. If you read Korean, you should check. If you don’t read Korean, here’s a tip: if the ingredient list looks short, it’s probably vegan, and if the ingredient lists looks long, they’ve probably put cheese or chicken extract or something in it. South Korean convenience stores generally do stock juices, many of which are vegan. If you want an orange juice which does not contain animal products, I suggest the Lotte brand Jeju Orange Juice. I also like the Lotte Pine Bud drink. Unfortunately, there isn’t so much in the way of soymilk in convenience stores, and all of the soymilk I’ve ever found in South Korean convenience stores has some kind of animal product in it. In case you weren’t aware, pre-packaged kimchi, South Korea’s national dish, usually comes with shrimp and/or anchovy paste. This is true of 100% of the kimchi brands sold in convenience stores. I’ve read that there are some vegan brands of kimchi available in supermarkets, but nobody says what these brands are, and my Korean-reading skills aren’t quite good enough to find them myself. As is, the rule of thumb is this: if the kimchi comes from a vegetarian restaurant, or if you make it yourself, it’s vegan. Otherwise, assume it has shrimp and/or fish in it. Making your own kimchi, by the way, is not a bad idea. It was much easier to make kimchi on the go than I expected, especially since the ingredients for kimchi are available practically everywhere in South Korea, and you don’t need a kitchen. If you, say, don’t want to buy an entire package of salt or pepper, you can explain to a Korean that you want to make kimchi, but need salt/pepper, and it is possible that they will offer you their own salt/pepper. There is a vegan kimchi recipe here, but it’s not practical without a kitchen, so let me tell you: kimchi-making is really flexible once you know the basics. The only equipment you really need is a) a pot/bowl to soak veggies in the brine, and b) a glass jar for fermentation. Heck, you don’t even need a knife (though knives do help), let alone a food processor. Hostel/motel made kimchi goes well with microwaved rice. Prepare the kimchi before Koreans’ eyes for entertainment value. What I said about hostels in the previous post still applies. The difference is that the selection of hostels in smaller cities is even smaller than in major metropolises (the glaring exception being Gyeongju, since it’s one of South Korea’s top tourist draws). Thus, the likelihood of finding a hostel which does not include non-vegan breakfast in the price, or even finding a hostel with a kitchen, is much lower. One time I went to a hostel which advertised kitchen access online, but when I got there … ooops, no kitchen. When I explained that Hostelworld promised a kitchen, and that I was a vegetarian, and that there were no vegetarian restaurants in town, the hostel owner let me cook in his parents’ private kitchen. That said, new hostels/guesthouses open up all of the time in South Korea, so hopefully by the time you read this there will be more and better options than there were in 2014. You can actually find street snack vendors in any settled part of South Korea, whether it’s a major metropolis or humble small town, but I seemed to find them most often in smaller cities. – ROASTED CHESTNUTS: these are a bit expensive, but hey, chestnuts are one of Korea’s representative foods. 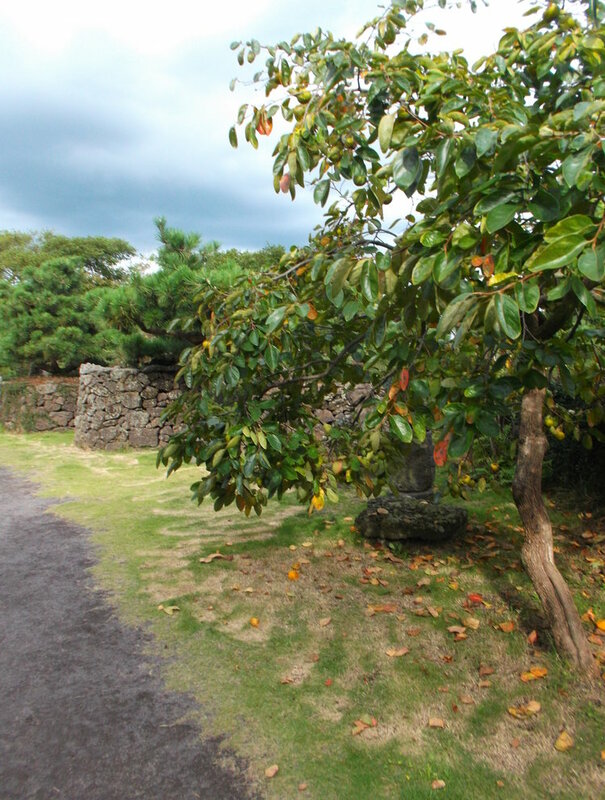 I sure found a lot of wild chestnut trees during my hikes through South Korea’s forests. – STEAMED CORN on the COB: this is cheaper, and is a good way to fill your stomach. These vendors tend to appear near tourist sites and bus stations. Many bus stations in the countryside also offer a cheap, simple puffed corn snack in plastic bags. The ingredients are basically just corn, salt, and sugar. These are great to grab right before a long bus ride (you are allowed to eat on South Korean intercity buses). In the next and final part, I will discuss getting vegan food in temples and villages. This entry was posted in Overview and tagged food, veg*nism, vegan travel, vegetarian food in South Korea, vegetarnian travel. Bookmark the permalink. Pingback: Getting Vegan Food While Travelling through South Korea Part 3: Temples, Small Towns & Villages | S.K. in S.K.